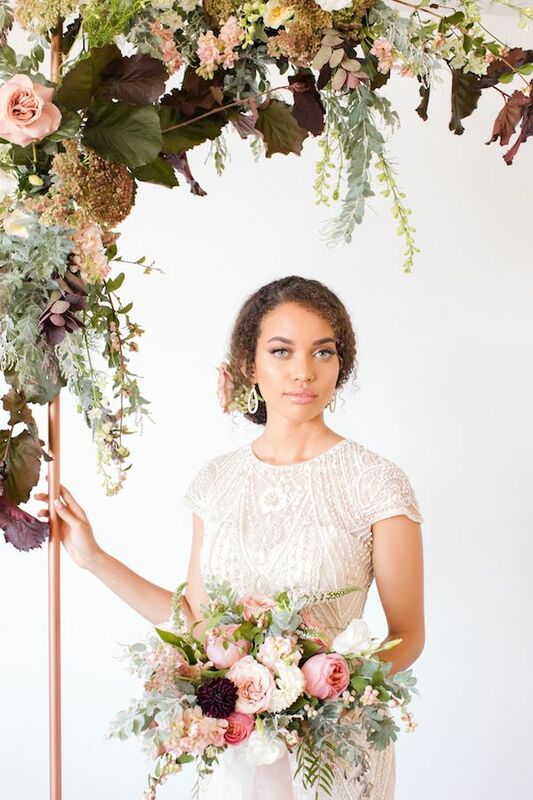 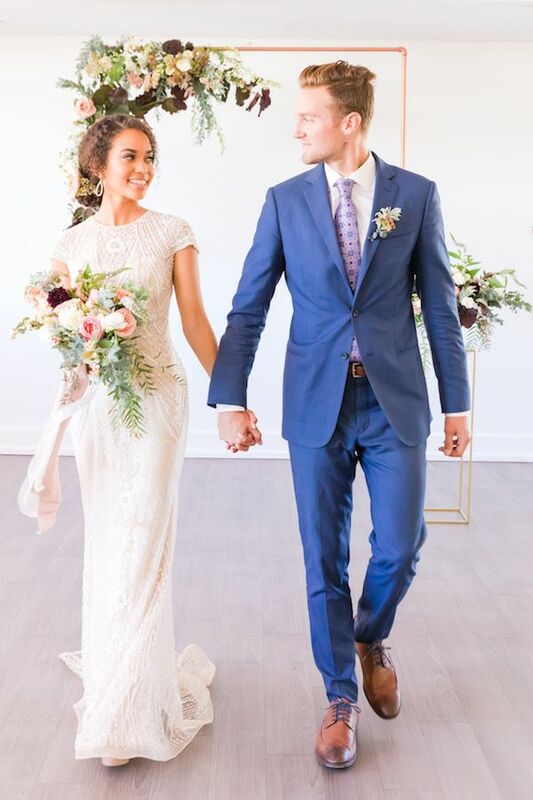 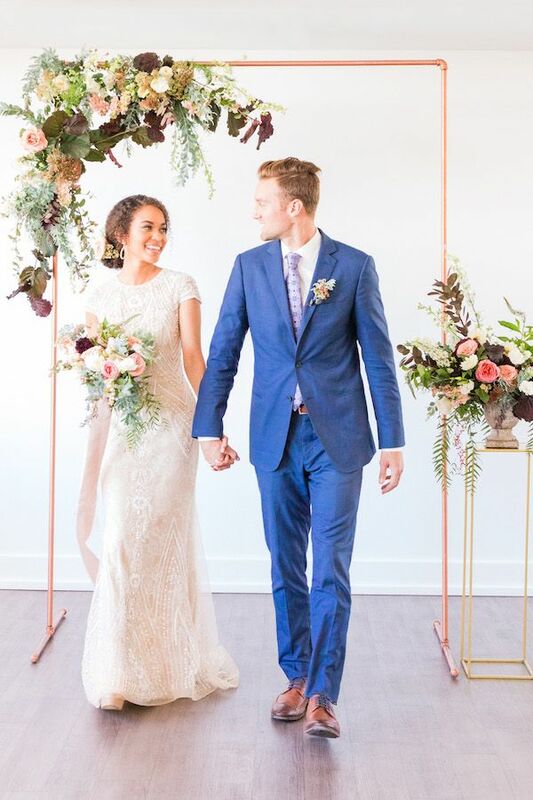 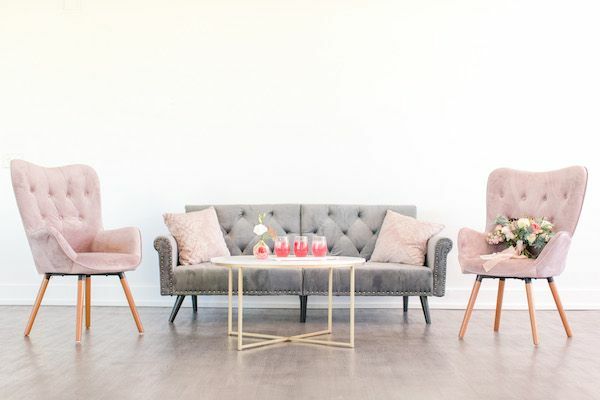 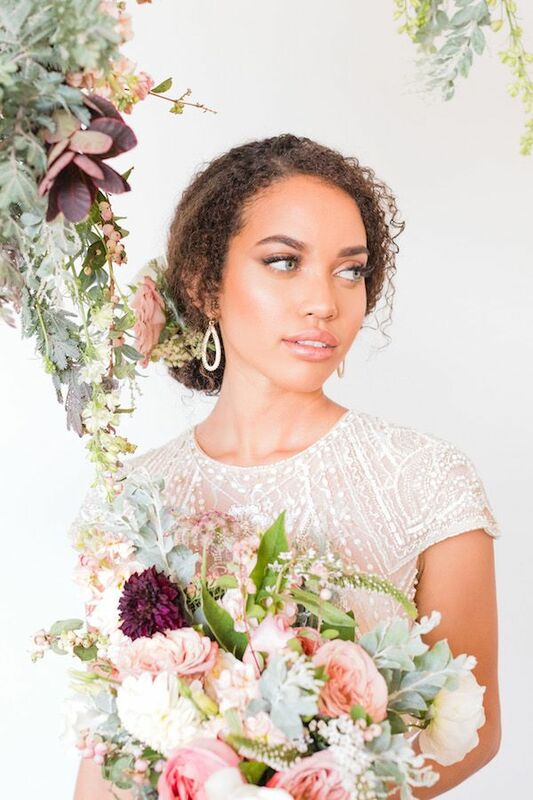 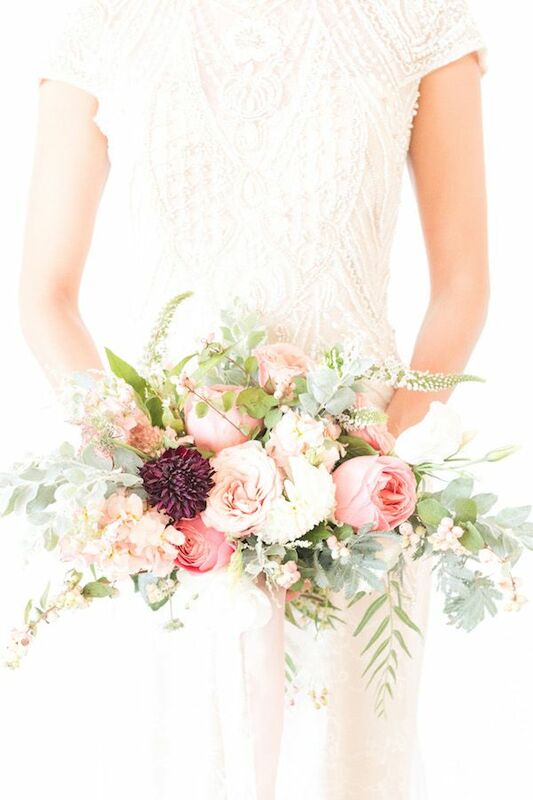 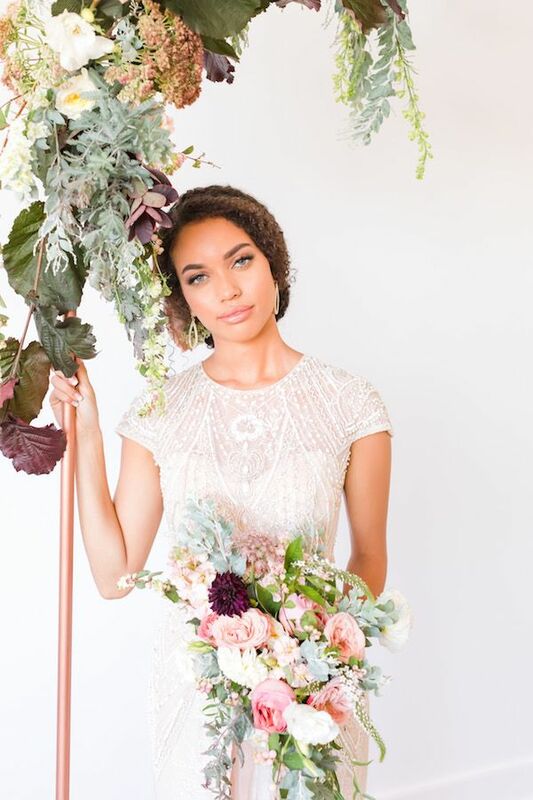 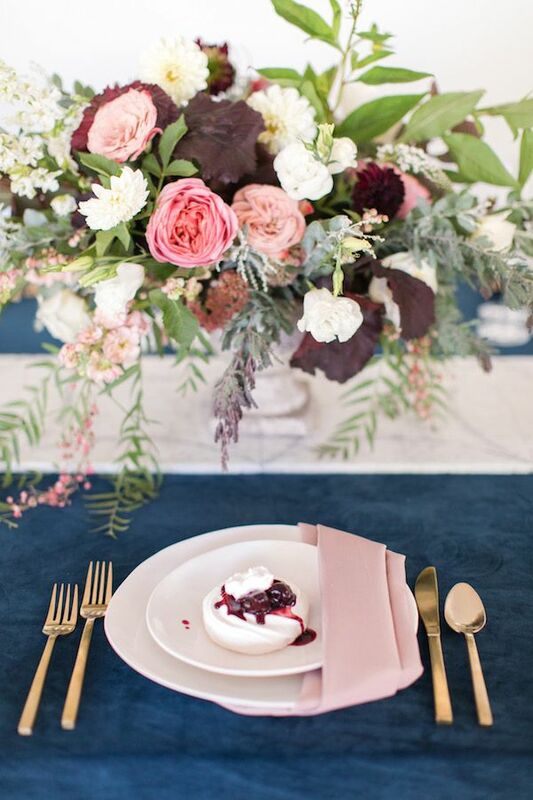 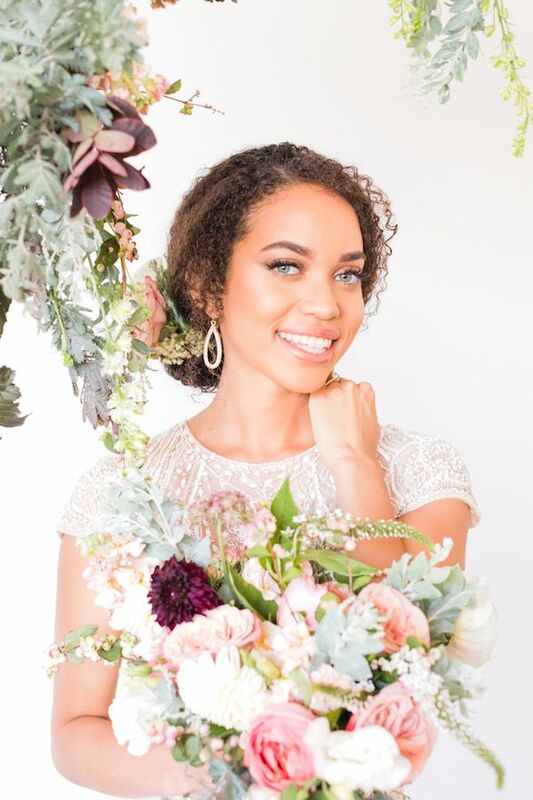 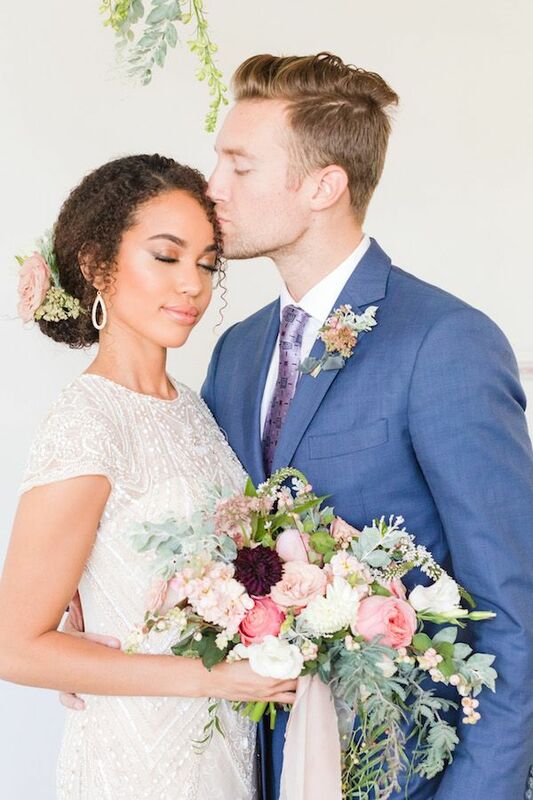 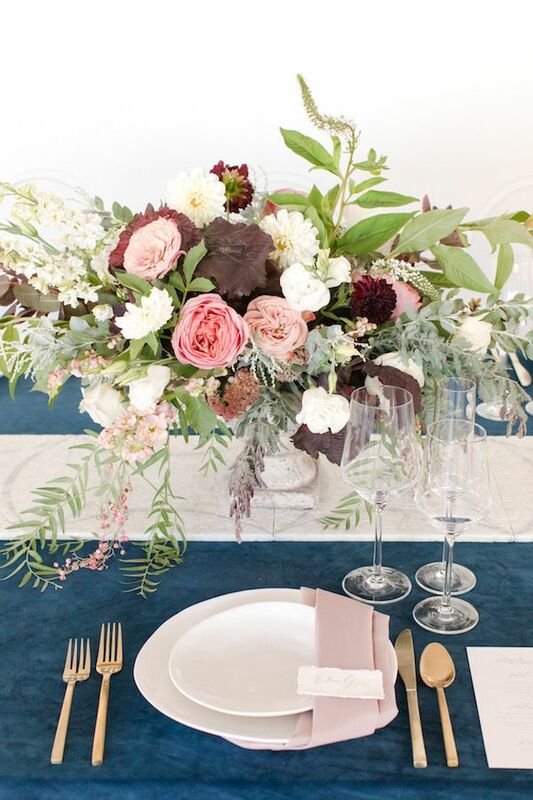 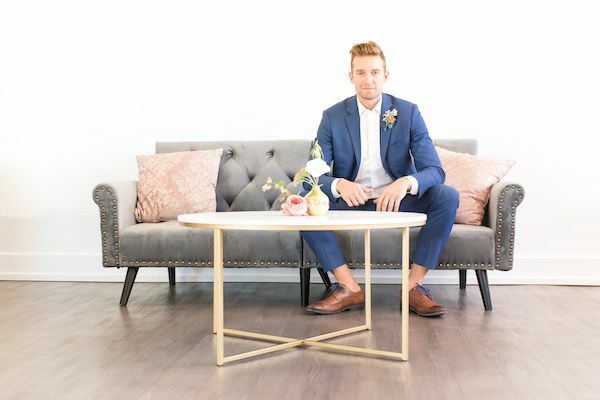 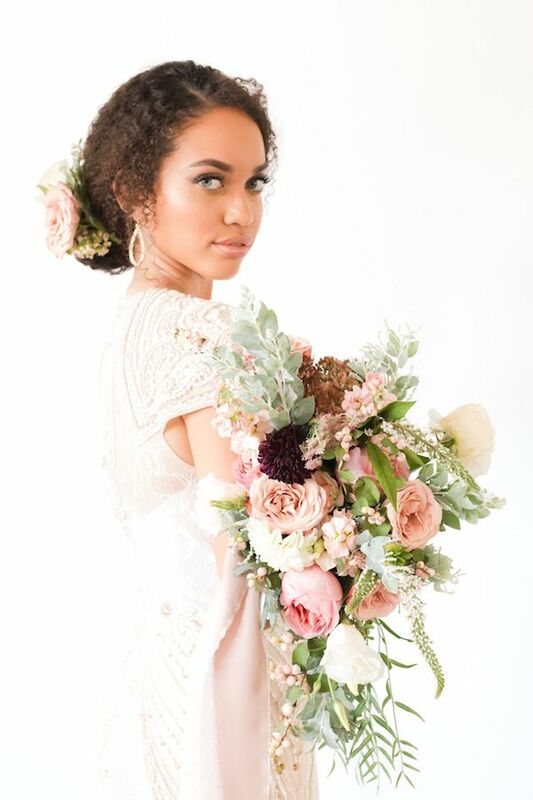 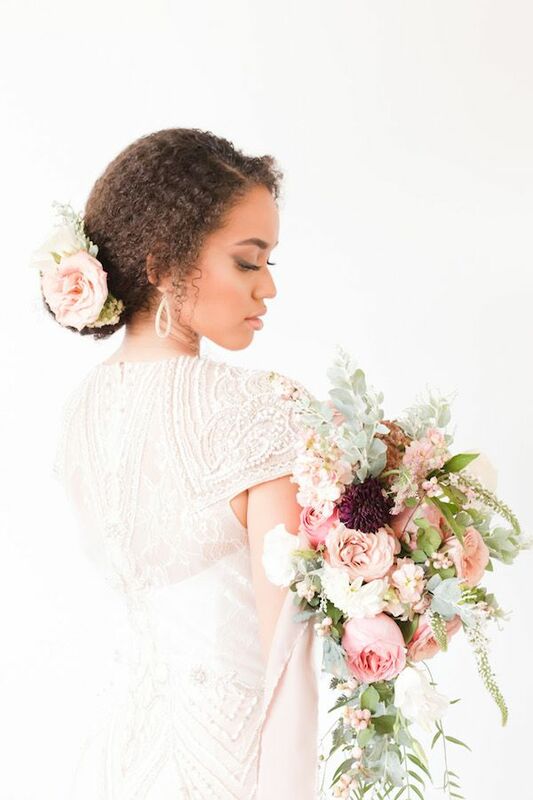 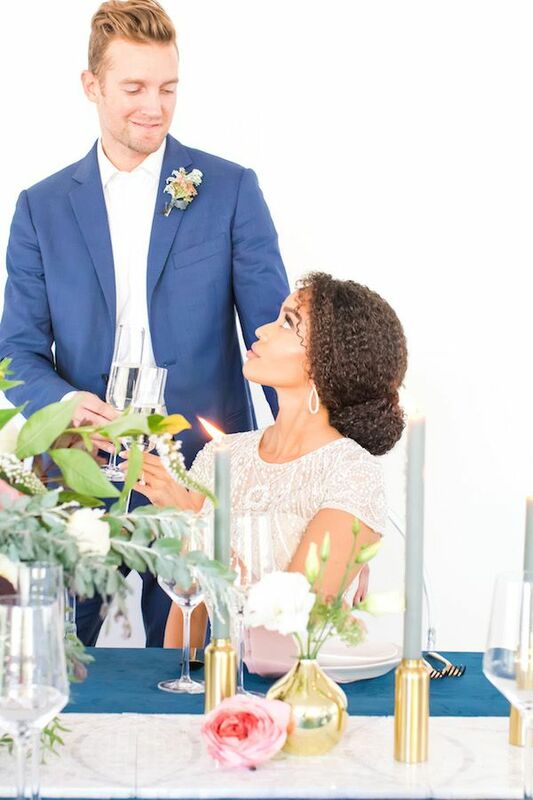 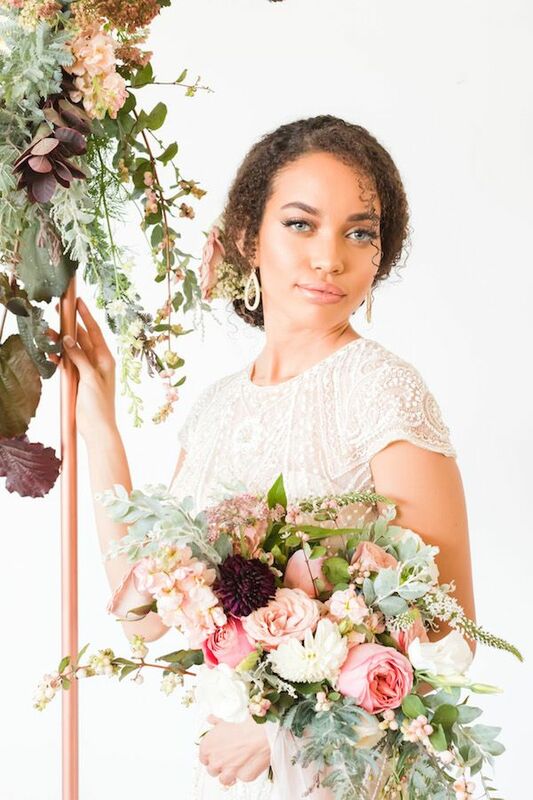 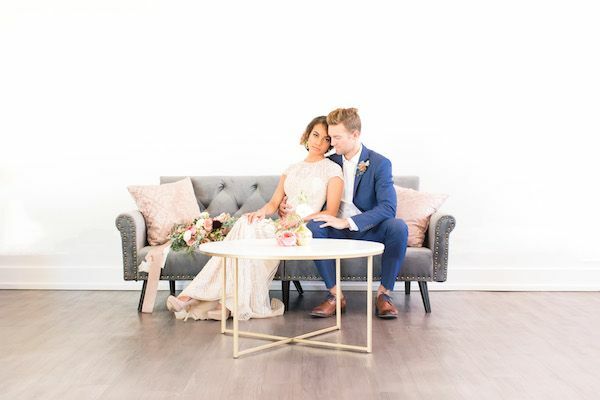 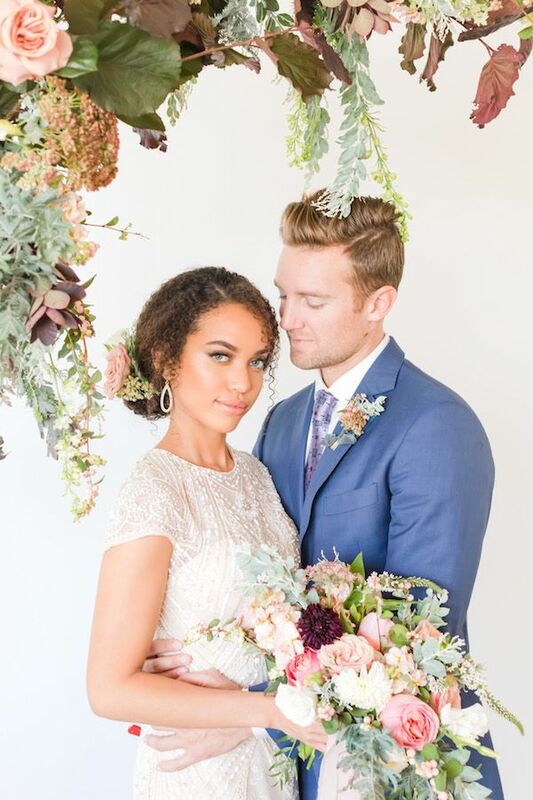 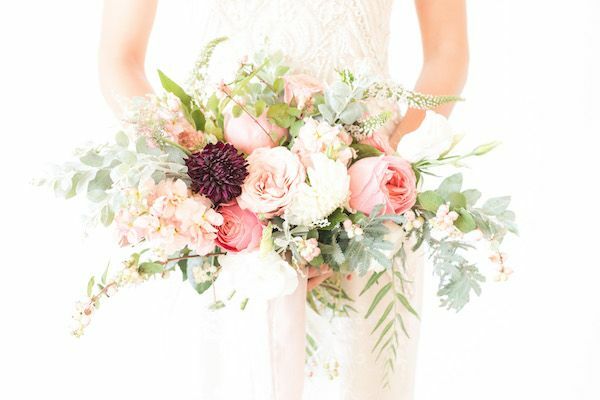 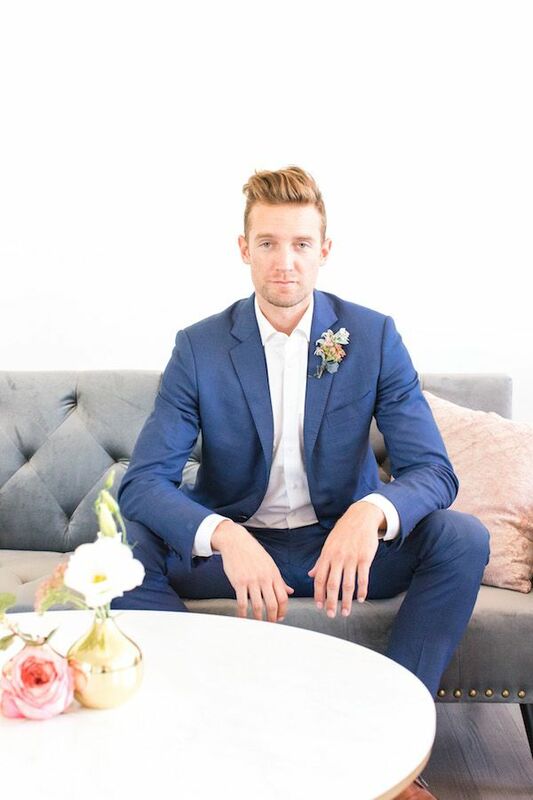 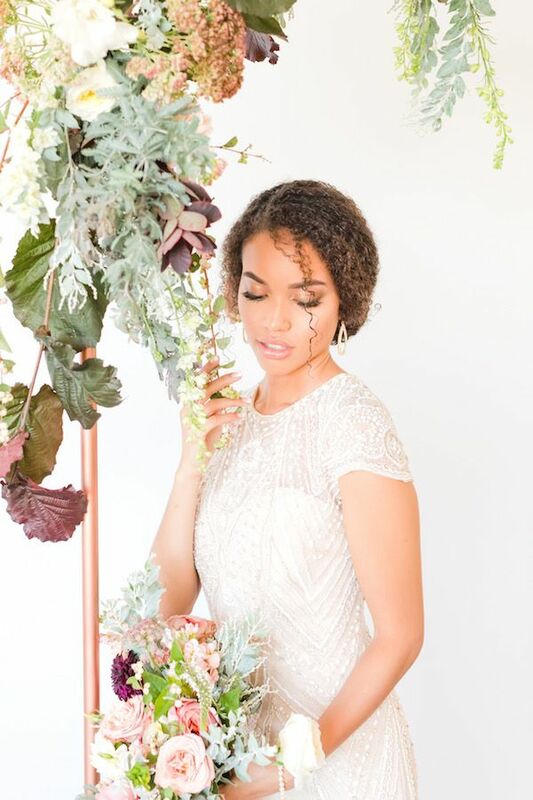 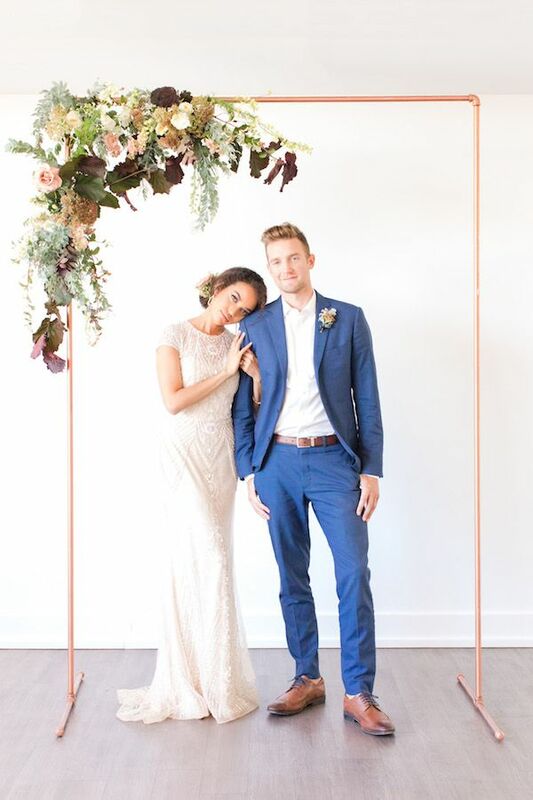 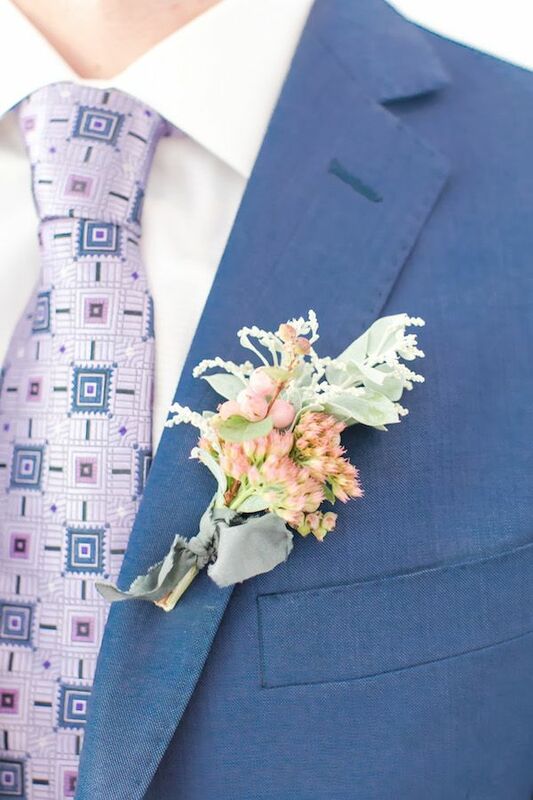 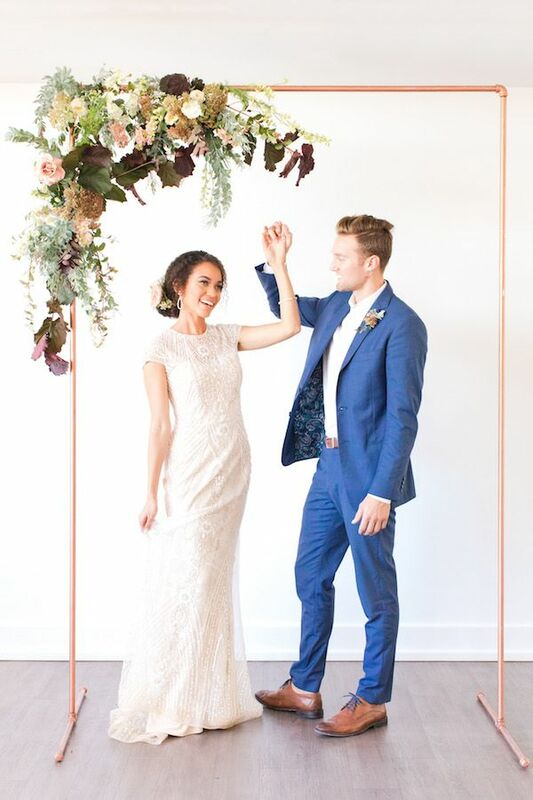 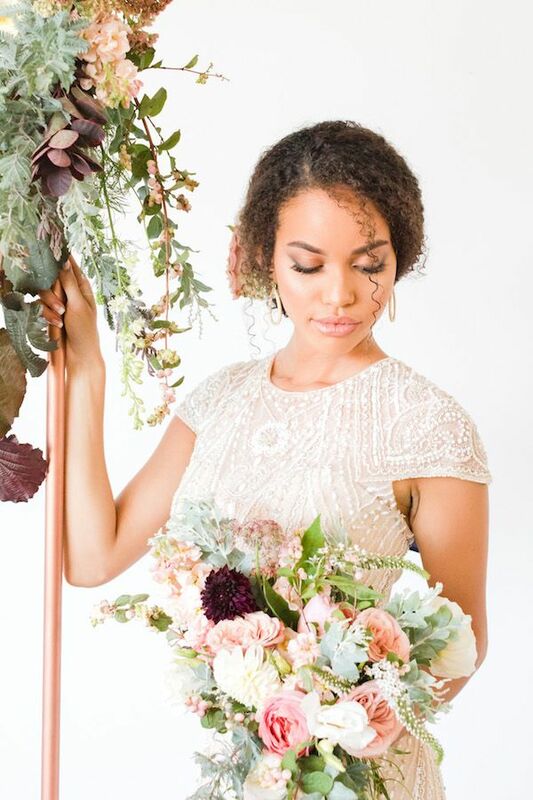 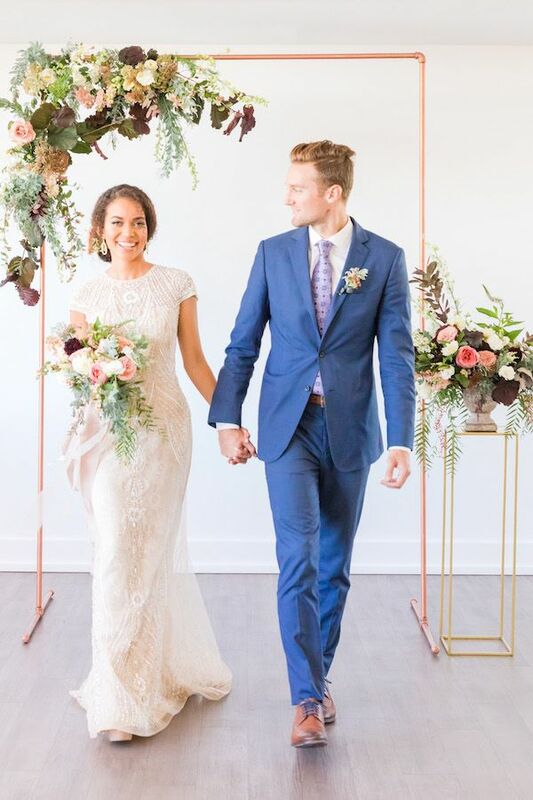 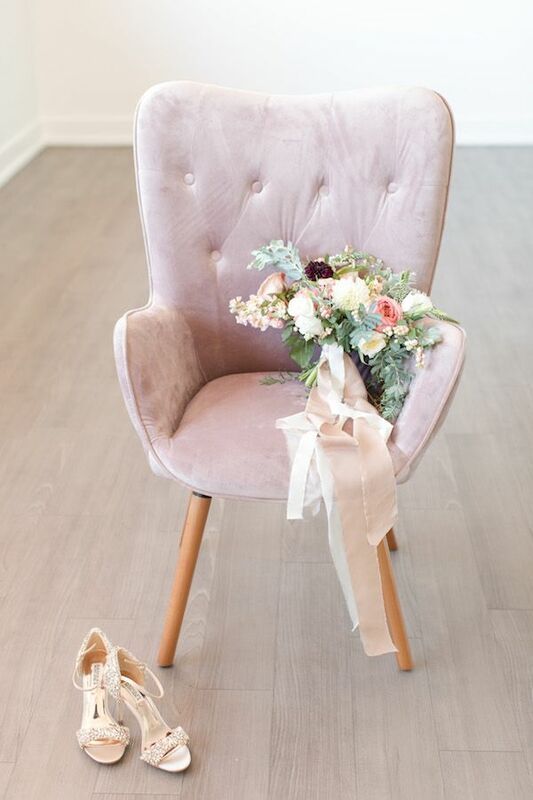 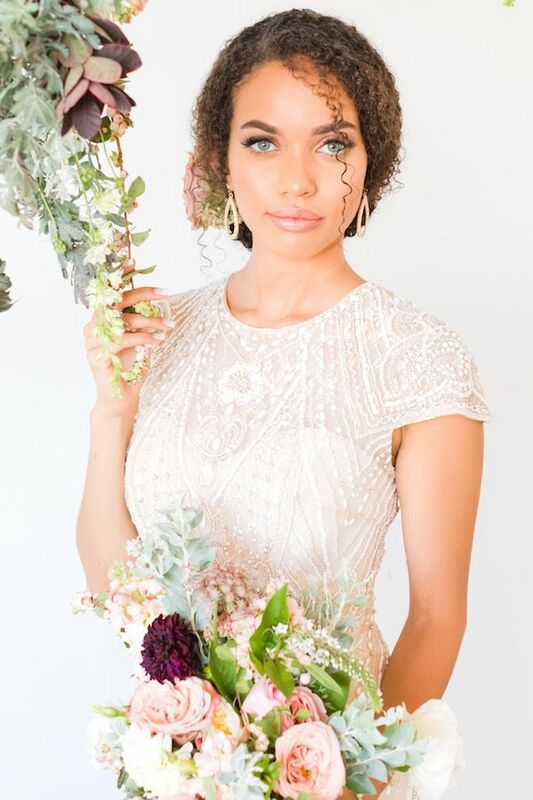 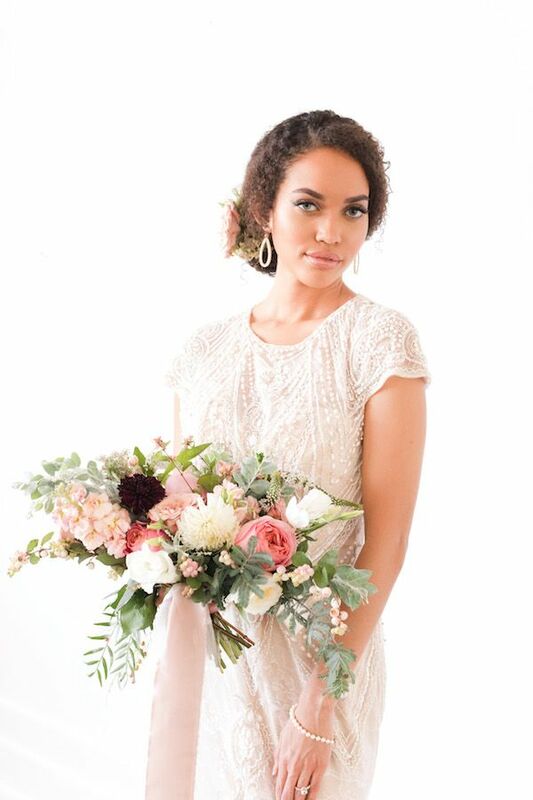 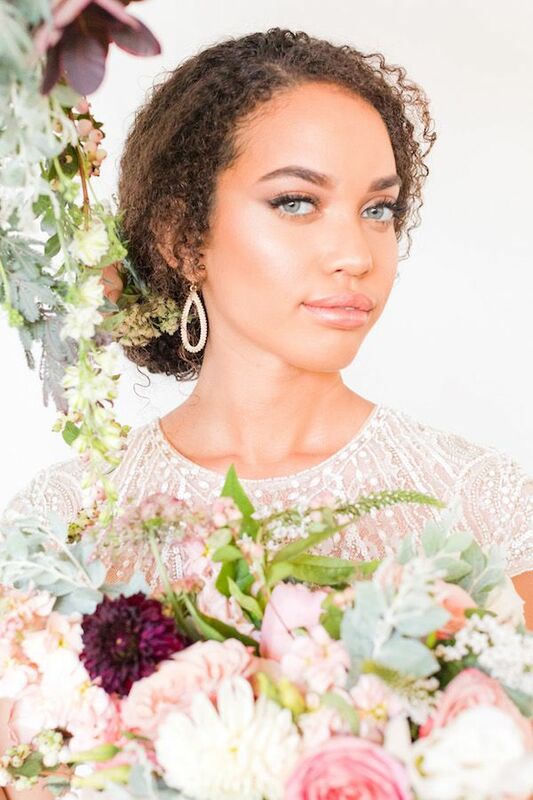 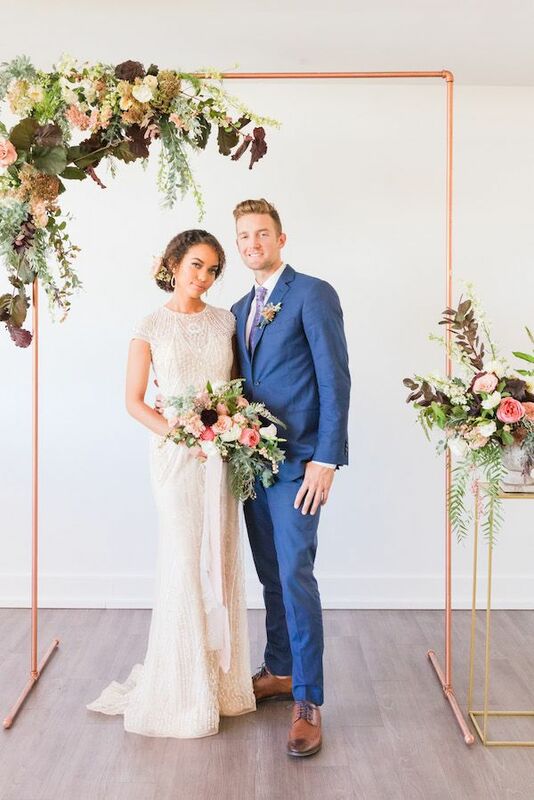 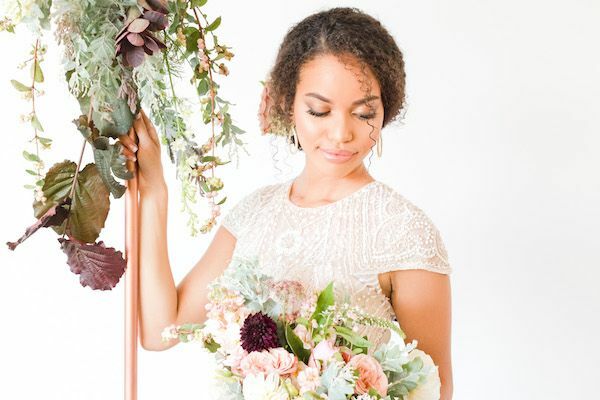 Styled at Clayton on the Park in Scottsdale, Arizona - today's feature showcases images from photographer Malone Sinclaire, design and styling by Shine Events AZ and lovely floral creations from Sarah's Garden. 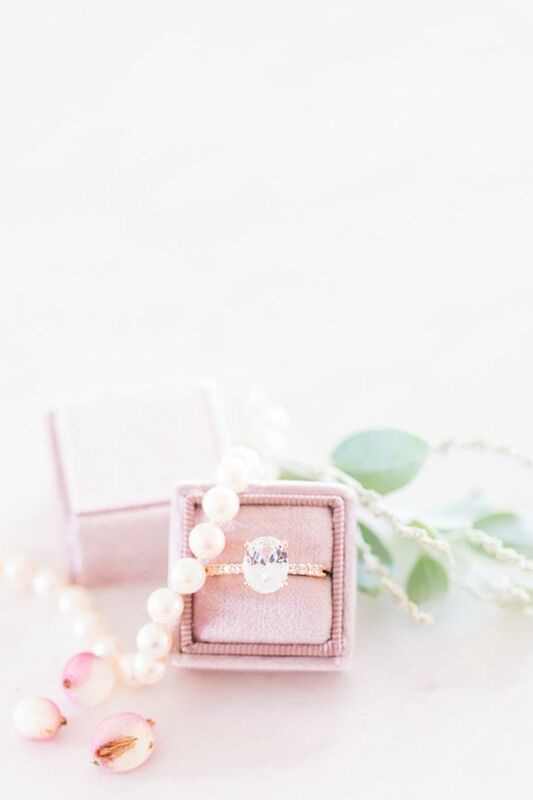 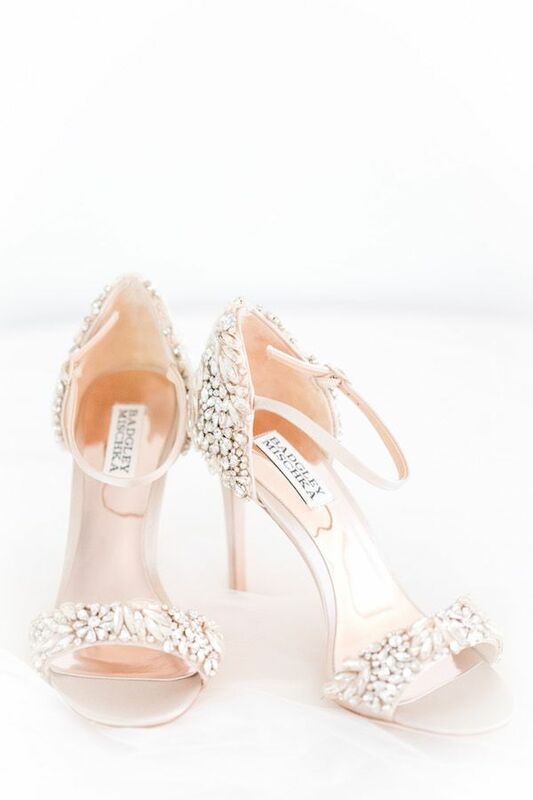 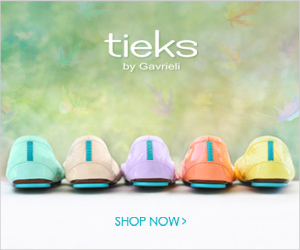 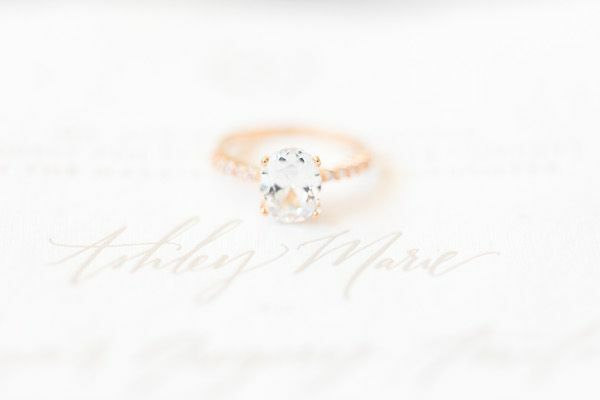 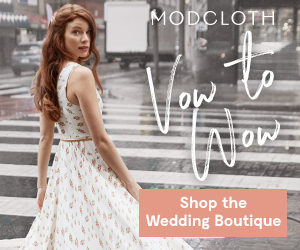 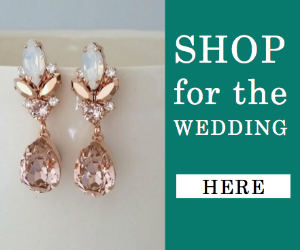 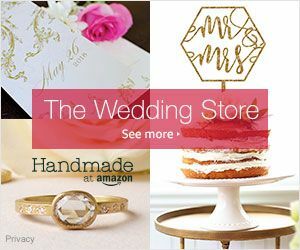 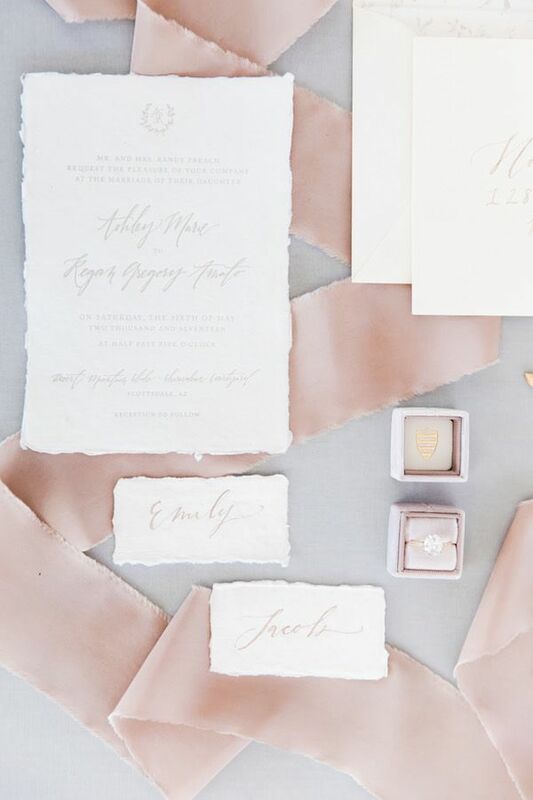 Hold onto your hearts — because this, m'dears is truly the stuff that wedding dreams are made of. 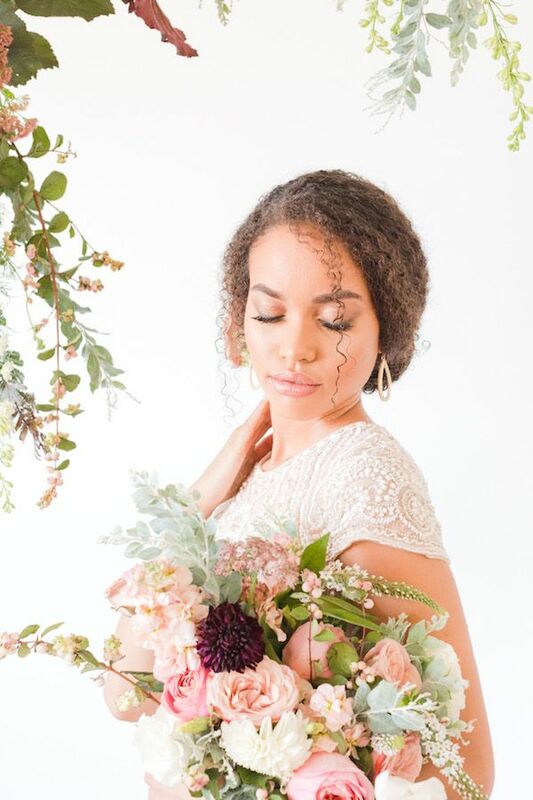 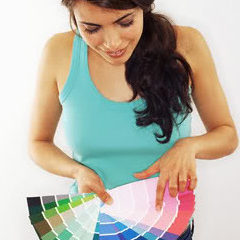 From designer, "I set out to create a design that was romantic and organic in feel but would also fit in a modern space. 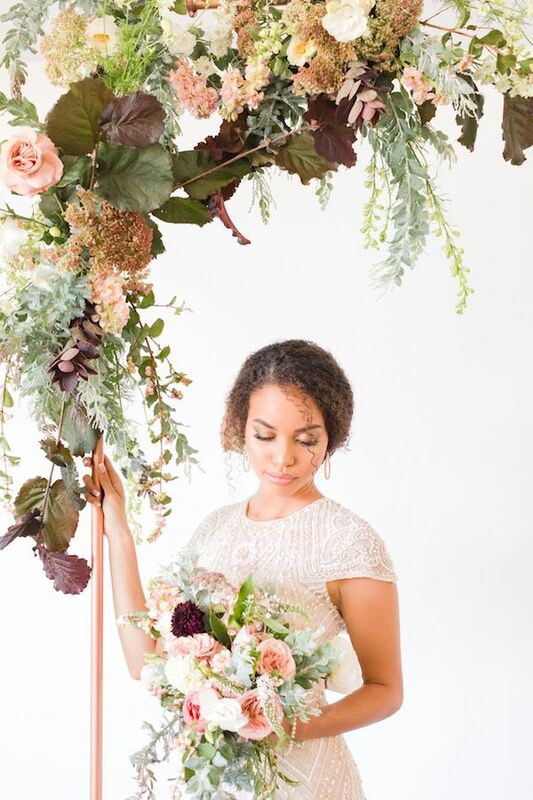 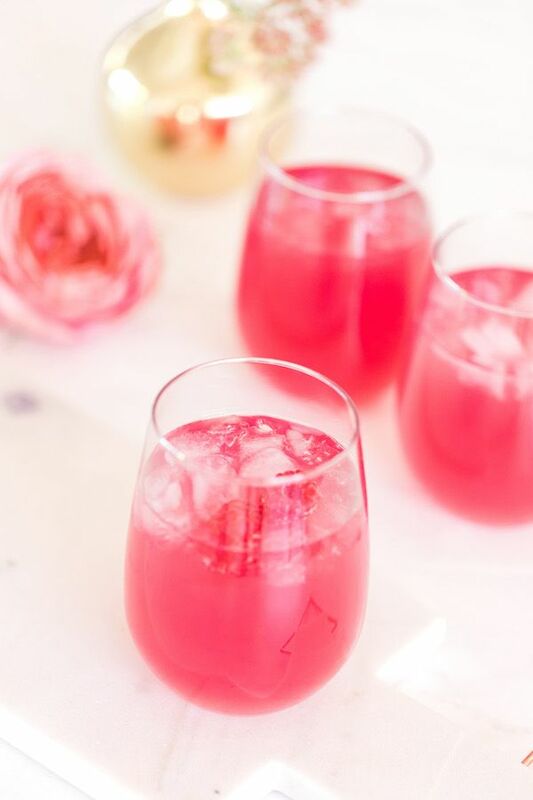 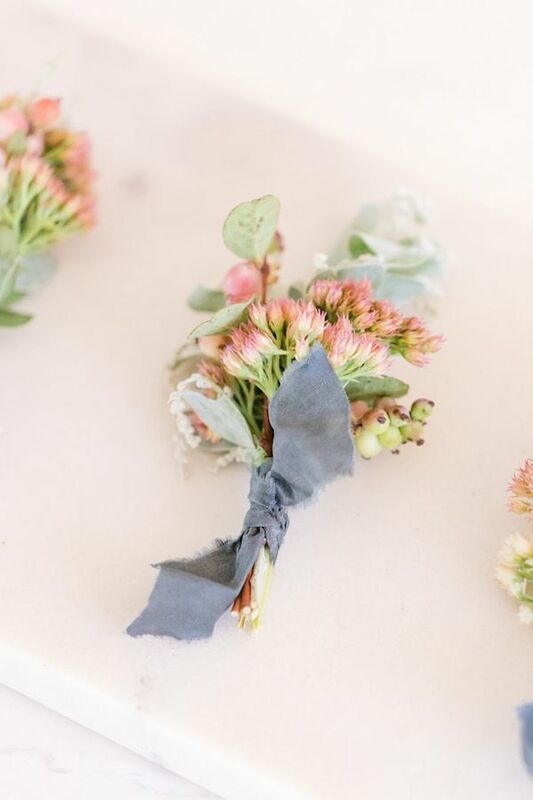 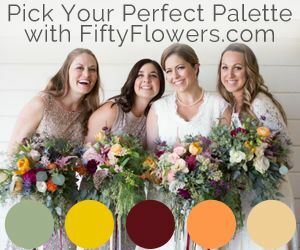 I also wanted to implement a color palette that I felt had more depth and passion to it than the more typical white, blush and green we see frequently here in Arizona." 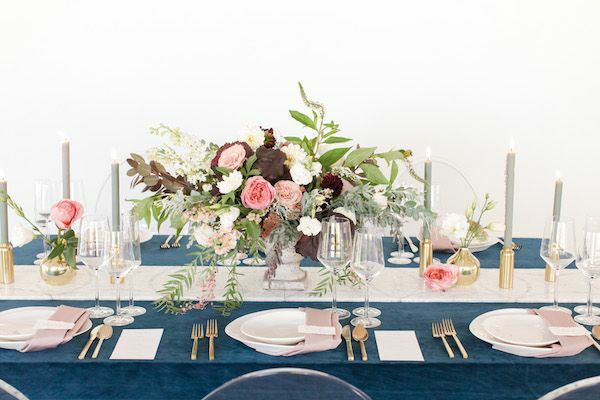 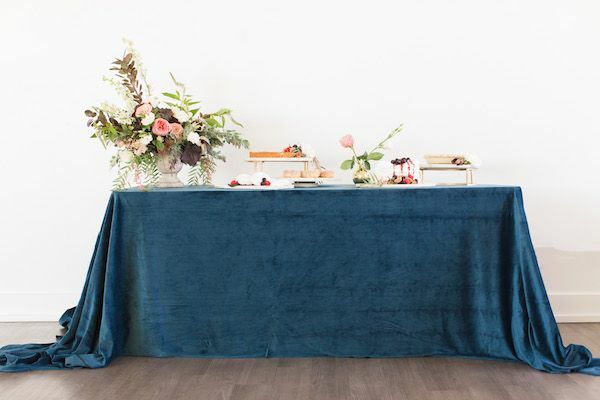 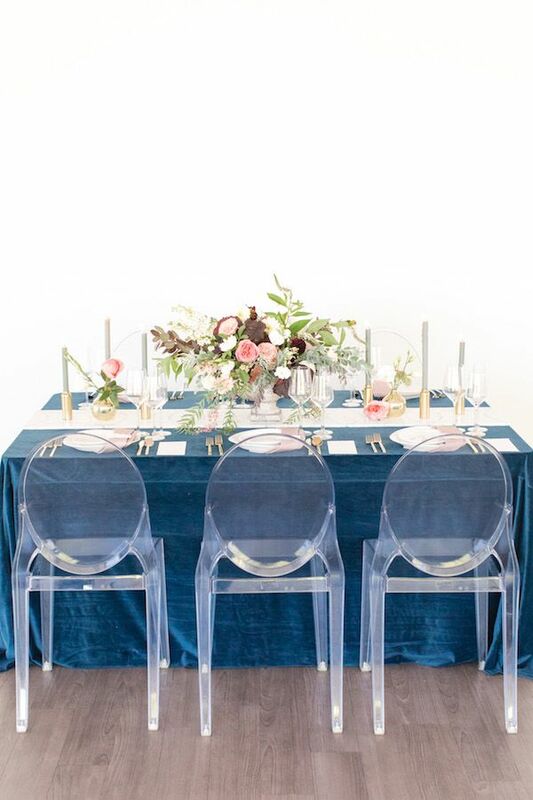 "Finding inspiration from a mosaic stone tile that we used as the table runner, we added in the navy blue velvet linen and mauve napkins, and then juxtaposed those against a white background and elegantly modern ghost chairs." 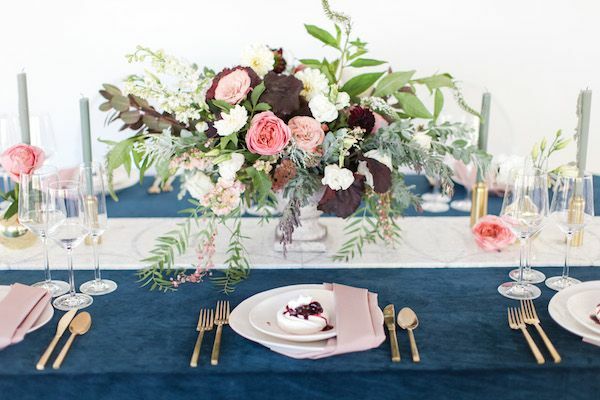 Rentals from Event Rents AZ and Lace and A Barn really helped to set the scene for romance. 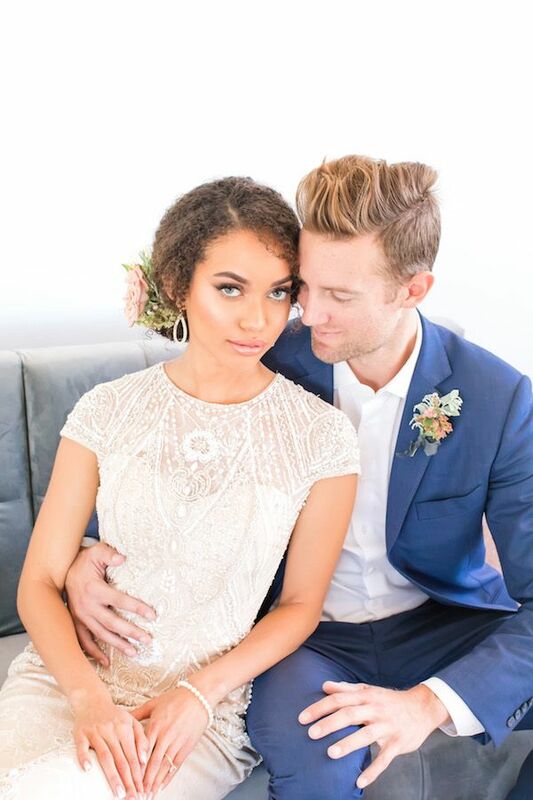 And hair and makeup by Makiaj Beauty was absolutely flawless. 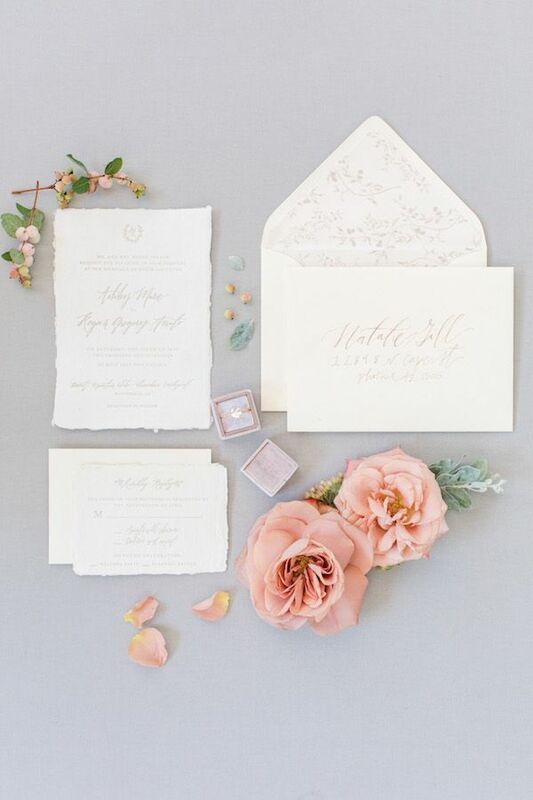 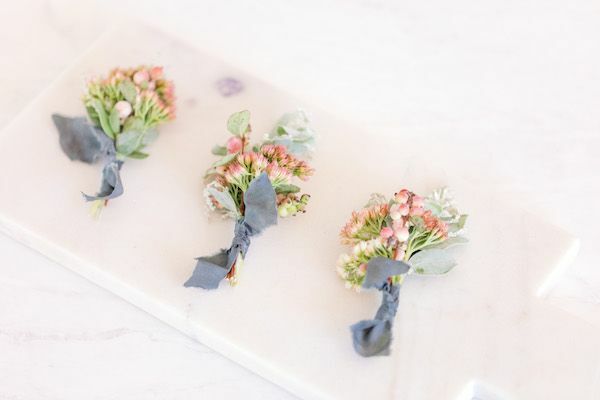 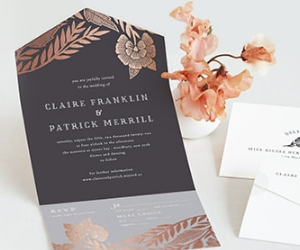 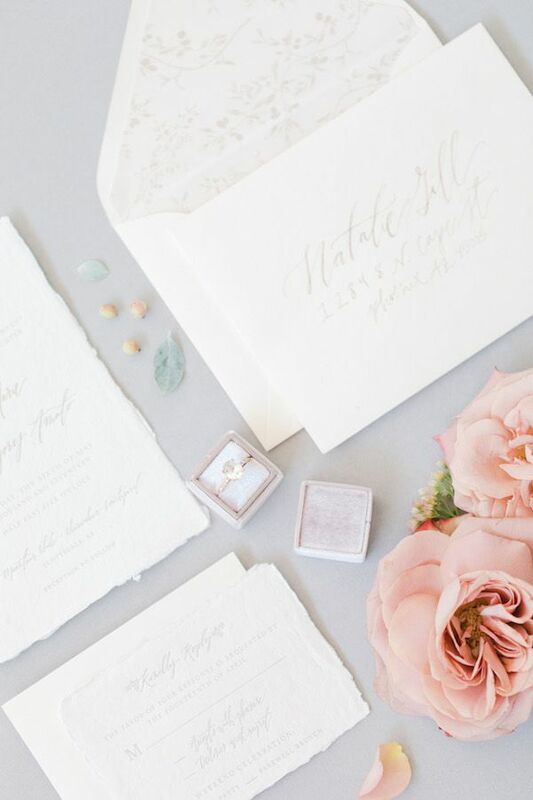 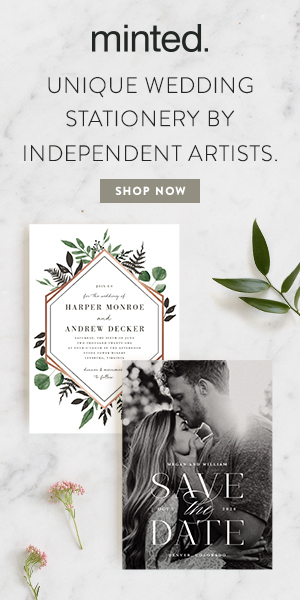 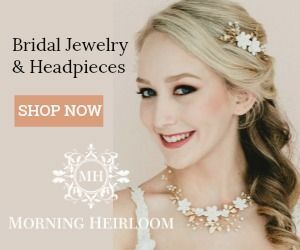 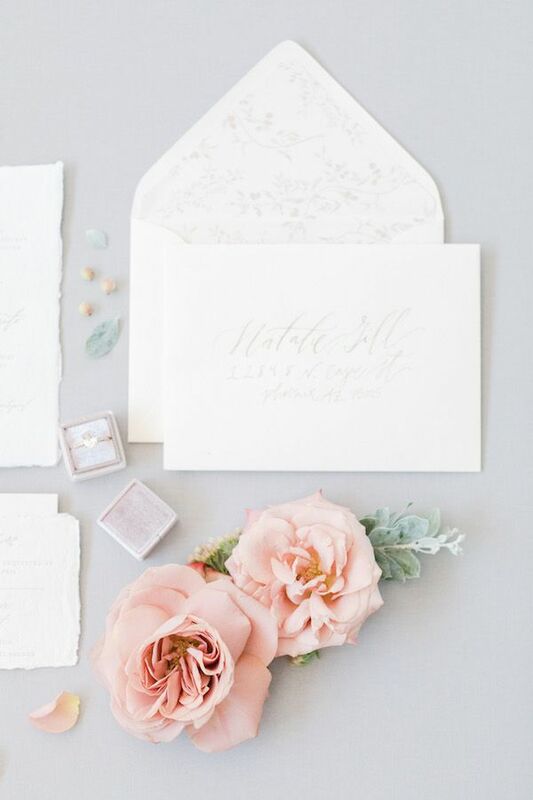 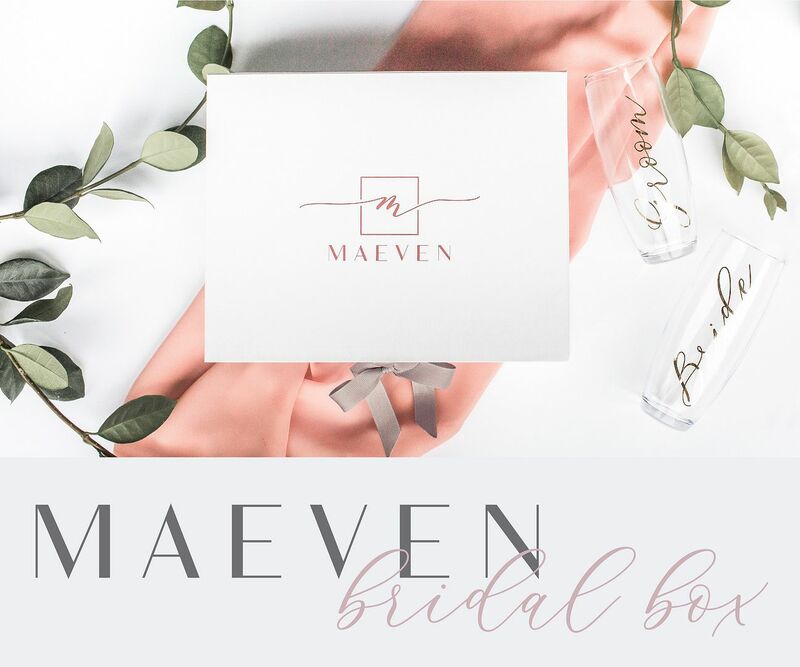 More the designer, "The stunning invitations from Foil & Ink feature handmade paper and letterpress details, including hand-lettered calligraphy on the place cards." 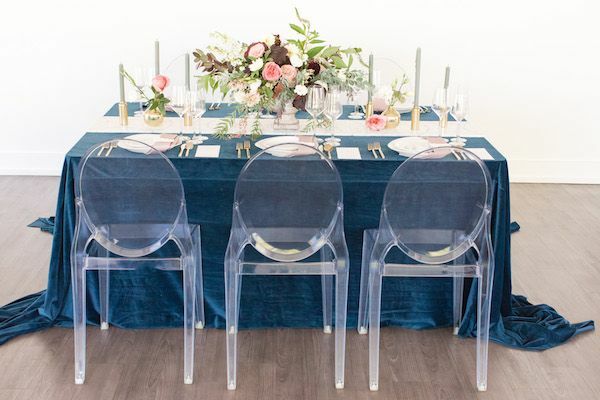 Linens from La Tavola Linen truly completed this romantic setup with velvet finishes and amazing textures. 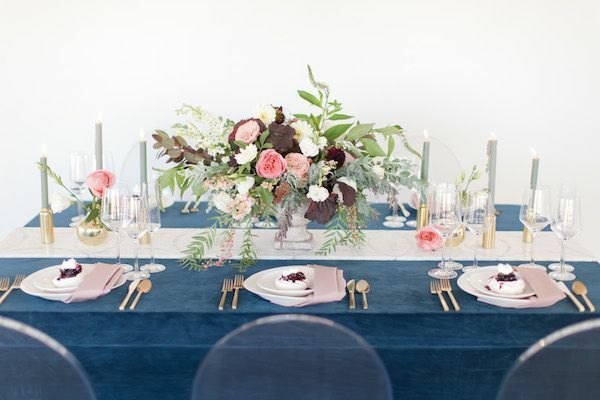 "I just love the way the texture of the velvet linen and handmade paper play against the more modern elements of the gold candlesticks, flatware and ghost chairs." 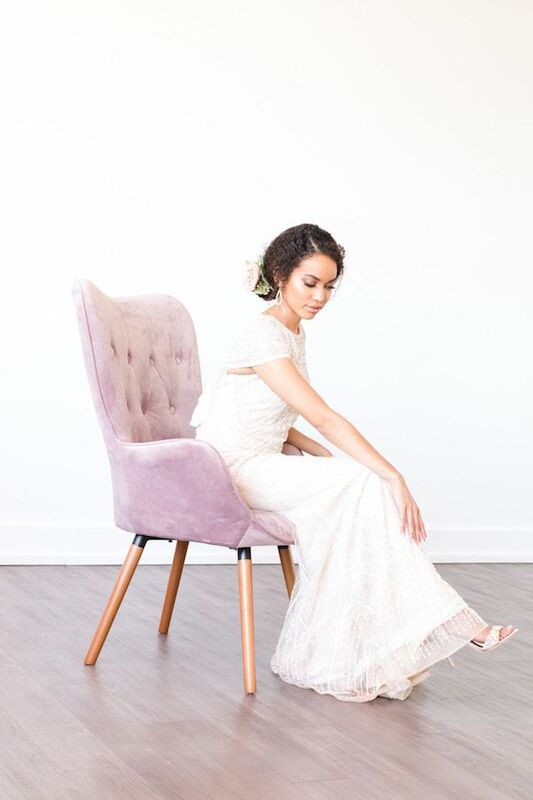 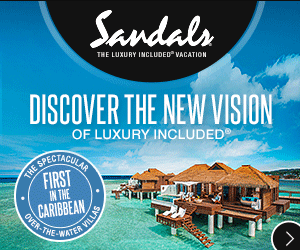 "In choosing our bride's dress, we decided to go with a design that evoked a more elegant and contemporary feel. 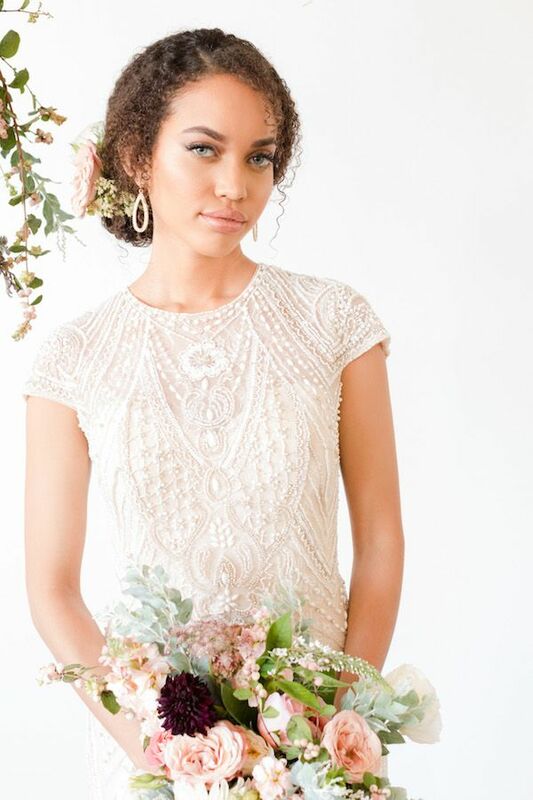 The gown, by Morilee, features intricate bead word, Chantilly lace, a high neckline and cap sleeves." 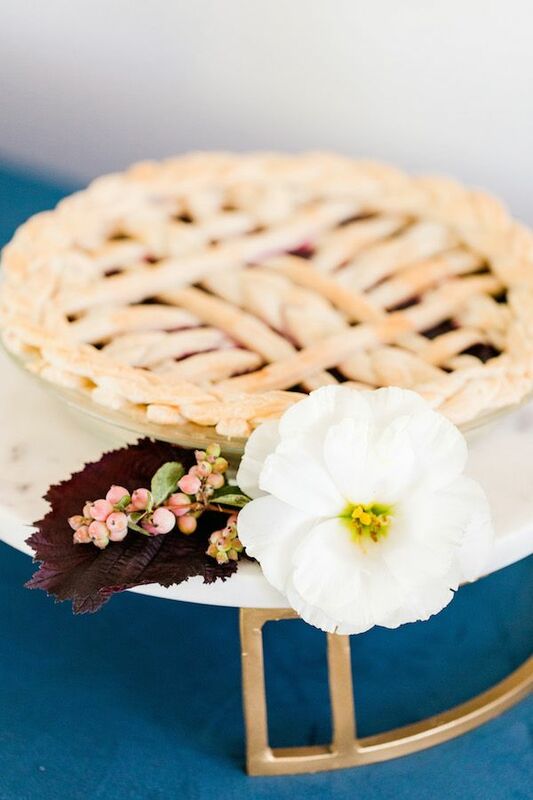 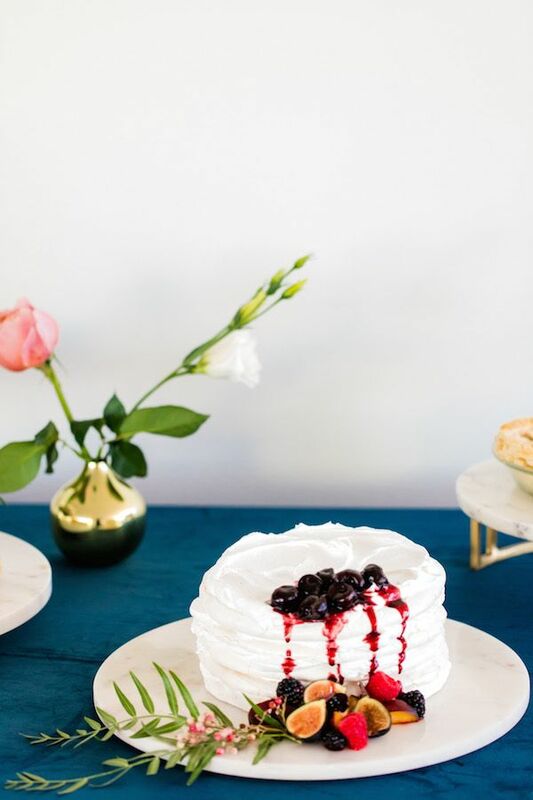 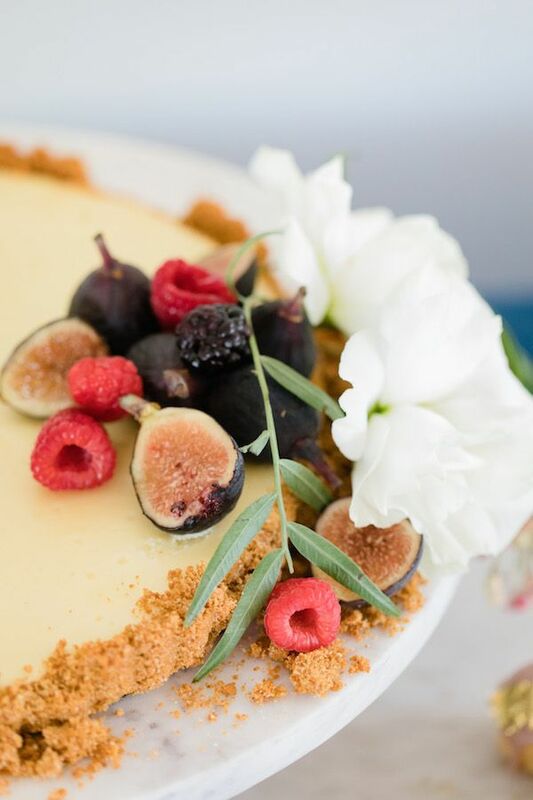 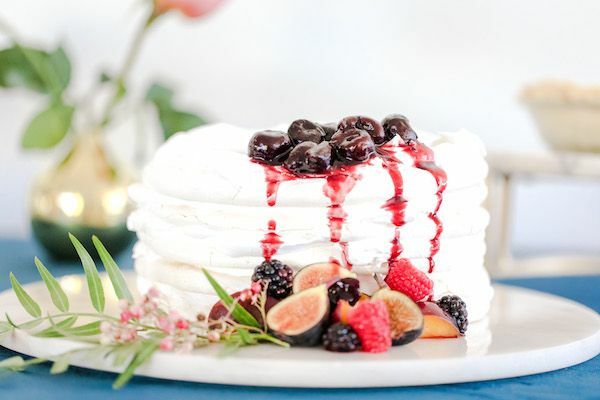 Desserts from A Bakeshop Cake added a touch of sweetness to this already sweet shoot. 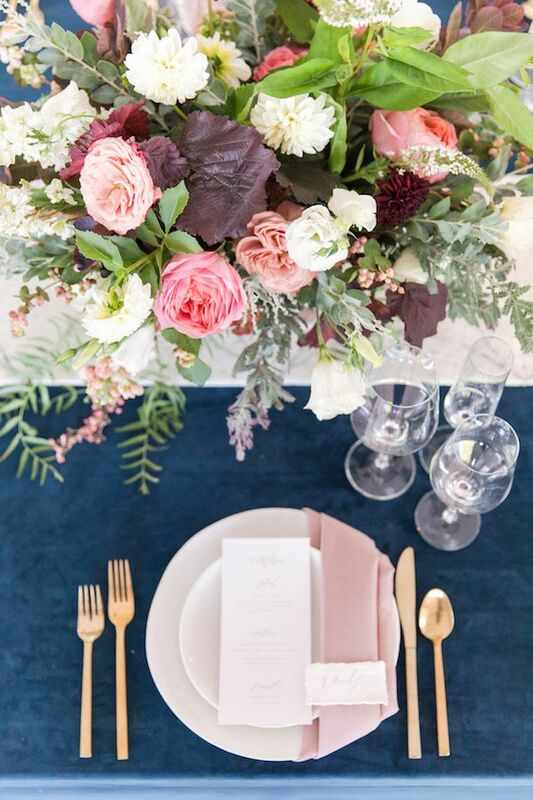 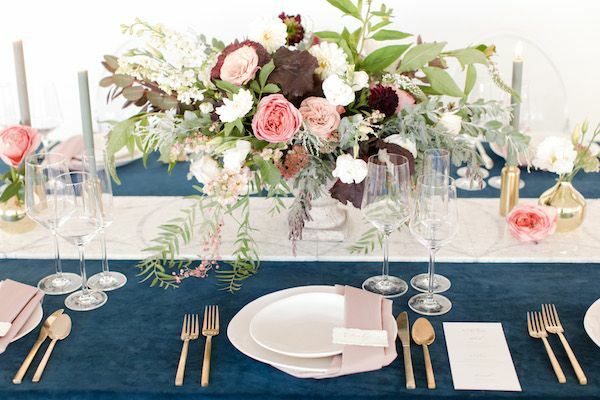 1 One Comment " Navy & Blush Meet Copper in this Romantic Fête "